SEATTLE, Washington, September 30, 2011 (ENS) – Trident Seafoods Corp., one of the world’s largest seafood processors, has agreed to pay a $2.5 million civil penalty and invest at least $30 million more in seafood processing waste controls to settle alleged violations of the Clean Water Act at its facilities in Alaska. Unauthorized discharges of seafood processing waste have created large seafood waste piles on the sea floor, fostering oxygen-depleted conditions that result in unsuitable habitats for fish and other living creatures. 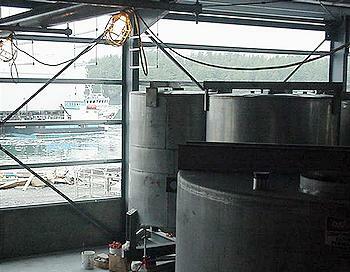 One waste pile in Alaska’s Akutan Harbor is estimated to extend over more than 50 acres. “Today’s settlement signals an important change in how seafood processing is managed in Alaska,” said Cynthia Giles, assistant administrator for the U.S. EPA’s Office of Enforcement and Compliance Assurance. “Trident’s investment in fishmeal facilities and commitment to improving its waste management practices will help protect our nation’s waters and set the standard for Alaska’s seafood processing industry,” she said. “This agreement will benefit the quality of Alaskan waters, which host a critical habitat for the seafood industry,” said Ignacia Moreno, assistant attorney general for the Justice Department’s Environment and Natural Resources Division. “The upgrades will enable Trident to achieve and maintain compliance with the Clean Water Act, and will protect Alaskan waters, eliminate waste and create efficiencies that will serve as a model of best business practices for the seafood processing industry,” Moreno said. The agreement requires Trident to invest at least $30 million in source control and waste pile remediation measures. Source control measures include building a fishmeal plant in Naknek, Alaska that can handle at least 30 million pounds of seafood processing waste annually, taking in both its own fish waste and potentially that of other local processors. Trident has agreed to reduce the amount of seafood processing waste discharged from its Akutan, Cordova, St. Paul and Ketchikan facilities and monitor the amount of seafood processing waste discharged into Starrigavan Bay in Sitka, Alaska. These actions can reduce Trident’s fish waste discharges by a total of more than 105 million pounds annually. The company also has agreed to remediation measures, including studying seafloor waste piles at Trident’s facilities in Akutan, Ketchikan and Cordova. Based on the results of these studies, Trident will remove or partially remediate the piles. The EPA complaint, also filed as part of this legal action, alleges that Trident has had more than 480 Clean Water Act violations at 14 of its on-shore and off-shore Alaskan seafood processing facilities. Several of the alleged violations concern failing to comply with permit restrictions on discharge locations, including discharges into at least two National Wildlife Refuges. Other alleged violations include: discharging without a necessary permit, exceeding discharge limits and creating oxygen-depleting underwater piles of fish processing waste larger than the allowed one acre of seafloor. The company also allegedly failed to conduct required monitoring and implement required best management practices. Over the past decade, Trident has been a party to multiple administrative enforcement agreements and judicial consent decrees resolving similar violations at many of the same facilities, the federal agencies pointed out. The settlement was lodged in federal court in Seattle and is subject to a 30-day public comment period.